This morning while doing a little bit of blog surfing I was totally inspired by Michelle at Joy Express with her post on “Hidden Clutter”. I used to be a huge clutter bug; I found it extremely difficult to get rid of anything from my past. Then after watching a program on T.V about clutter I realized that all of the “STUFF” from my past that I was keeping was actually keeping me in my past and not allowing me to move into “MY” future. So with that revelation now clear in my mind I systematically when through all areas of my house and got rid of the stuff that was holding me back. All went really well, but now that I have time to think I realize that over the past few months my home office has become a dumping ground for anything I didn’t know what to do with or didn’t want to deal with. It’s not all physical clutter, it is also things like way too many emails in my inbox that really don’t need to be there. 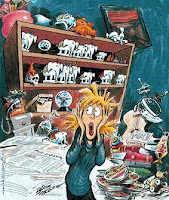 So after reading Joy Express this morning I decided to get stuck into the office clutter. I took a before photo thinking by tonight I would have a before and an after shot – Mmmm I don’t think so. There is way more stuff than I thought – bills that should have been paid – paperwork that should have been filed – stuff that should have been thrown away. So I will continue with the clean out and share it with you when I have completed. I have also realized that there is also a lot of clutter in my mind and life that I need to clear out but that is a whole post on its own. one of my very best friends Jenni next to her pool. Oh no.....not decluttering. It is so scary to think that there are places on this earth that are orderly and organized...I wouldn't know cuz I live in the land of small children and big hairy dogs and messy husbands and the "artist" who can't pick up at all. We are a mess literally and figuratively but I'm happy for you. (((hugs))) until next time. Oh Davine, something I have started doing! Need to de-clutter the loft, sheds, my clothes, cup-boards, even hoarding too much fabric!!! Always think it may useful one day! The charity shops will be really please with me when I get around to it all, but progress has been slow. I will continue though, as I know I'll feel better for it! I will join this queue, too. I try but in reality I have just spread the clutter into different piles all around the house. Just remember Davine that all that "stuff" didn't get there in one day, it's going to take time to rid yourself of it all, both literally and emotionally. I have a file cabinit with several years of papers that I need to clean out!! Glad you took a break! Making Lemonade out of Lemons!